Life has been the same. Now nearing my final year project subsmission, life just turn a lot more hectic. As usual, L came again, with more wonderful fare from up north Malaysia. This time is another Hong Kong wannabe bistro in Malaysia, which I had talked about and also cooked the famous cheese baked rice before. This kind of bistro is all over PJ and KL, now it is in Penang too. Talk about little Hong Kong in Malaysia! E-Gate is one of my all time favorite spots in Penang. Located just right off the bridge, just next to Tesco, it is a brand new plaza with restaurants, a fitness center, a hair saloon and a few pubs and a pretty huge Starbucks. Bored with regularly eating ‘tar-pau’ed (take away) food for meals, my friend suggested that we try a brand new Hong Kong styled restaurant in E-Gate. 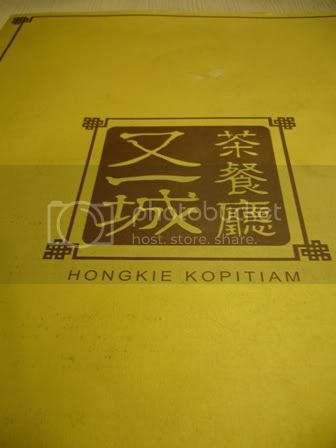 Hongkie Kopitiam has a very olden day Chinese restaurant ambience. Interior are mostly made of wood, including tables and chairs. Well it seems pretty congested to me as the furniture are placed within close proximity and the restaurant was almost full when I was there, perhaps it was regular dinner time. It has a very extensive menu with rather interesting names for its food and I took almost 10 minutes to decide on my order. My friend was there for the second time said that the French toast was really good. We ordered that, along with a bowl of Fuku Leslie Cheung for her, which is ramen with one fried egg, sausage, ham and vegetables while I opted for meal with a quirky name, Zoo Pharms, baked fragrance rice with cheese and a triple combination of fish fillet, beef and chicken. The meals we both ordered are very typical Hong Kong meals. 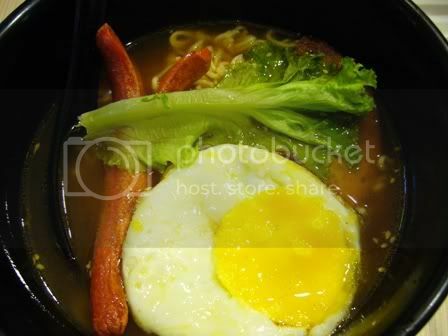 Her bowl of ramen consists of a sunny side up, deep fried ham and sausage, garnished with vegetables. The soup was pretty salty but the portion came big. 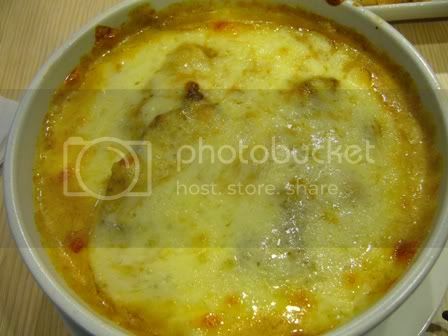 While my baked rice came with a generous serving of melted cheese with the triple combination of beef, fish fillet and chicken were nicely cooked and tender. It was good but somehow, eating too much cheese made me feel bloated. I could not even finish the serving. The French toast was superb. It was greasy due to the melted butter that came a top of the toasted bread, but the sweet and thick peanut butter in between the loafs was fabulous. Of course, you got to eat it while it’s hot. 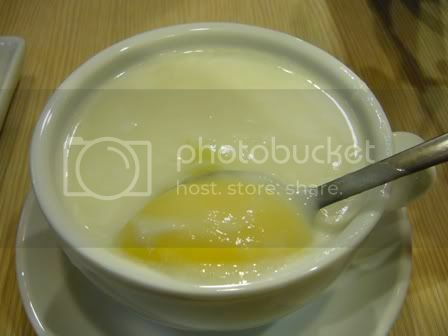 I ordered an almond tea with egg custard for my drink. I’m not sure why I kept expecting the infamous chilled ‘lai cha’ (milk tea) usually served in HK restaurants. Turns out, it came in a saucer, in scalding hot almond tea and a raw egg which I guess, was put in moments before it was served to me. It would at any other time, be a great cuppa for breakfast. However, after eating my baked cheese rice with awful lot of meat, I figure, that cup of sinfully sweet almond tea is just too much for me. Perhaps, this isn’t exactly a rave review but remember I said it had an extensive menu, I’m sure, with more time in the future, and I would get to try better stuff of it. Rachel, I am drooling over your food pics here. *lol* Got to go get something to eat now!! tazz and foodcrazee, lol, did not know the crazy impact is has on others, which i had too when i saw it! hmmm.. i wonder how much does all that cost? 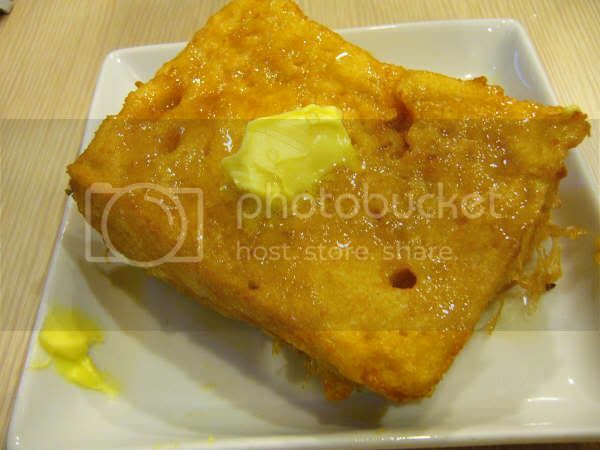 The French Toast looks great! IMBB 24: I Can Make it in 30 Minutes!